Considerable evidence shows mind–body interventions, including practices such as Qigong, meditation, and yoga, improve mental and physical health. How is poorly understood. One theory is they reverse the stress-induced changes in our cells linked to poor health and depression. A recent analysis of studies examining this theory suggests these practices quiet the activity of genes that promote inflammation, which is the body’s normal way of protecting itself against injuries and infection. Taken together, 18 published studies involving 846 participants over 11 years reveal that people who experienced stress but regularly engaged in mind–body practices had fewer biological signs of inflammation, reversing the effects of chronic stress and reducing the risk of harm to both physical and mental health. 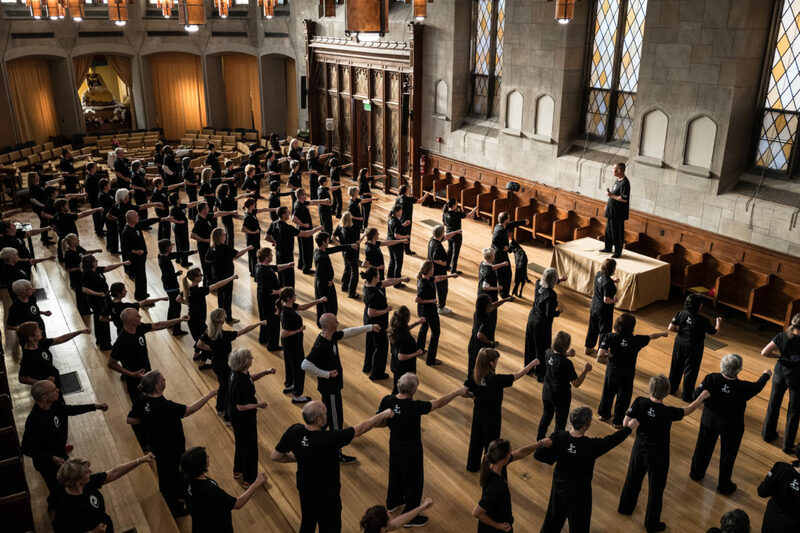 The very first study of mind–body therapies that explored the activity of genes provides early evidence that Qigong may regulate immunity, energy use, and cell longevity. More important, it may do so when cellular communication begins to orchestrate gene activity. A cell monitors itself and its environment, receiving and analyzing information then deciding how to respond. The mind and the body perceive stress as a threat or a challenge and respond naturally by using genes that share the same pathway and have the same function for either a fight or flight response. The simultaneous boost to the immune system was essential during early human history when wounds occurred more often. A short-lived response increases the body’s ability to heal injuries and fight infections. In today’s society, stress keeps the body stuck in a seemingly endless loop of physical, mental, and emotional pain. Disease, grief, trauma, and even poverty can trigger the immune system through the emotions these internal and external stressors produce–fear, anger, anxiety, despair, guilt, shame, and loneliness, to name a few. In addition to the primary response to stress—activating the immune system, adversity can suppress antiviral and antibody-related genes. The body becomes more susceptible to viral infections such as herpes simplex viruses, HIV-1, Epstein–Barr virus, cytomegalovirus, and the Kaposi’s sarcoma. Environmental stressors, such as a physical or social threat, also can prompt the brain to send out harmful molecules that travel back to it and initiate symptoms of depression. Food too can contribute to or reduce inflammation. When stress is severe or ongoing without relief, resolution, or counterbalance, health is threatened. Inflammation persists. Cells change. The risk increases for cancer, neurodegenerative and cardiovascular diseases, asthma, arthritis, and psychiatric conditions such as depression and posttraumatic stress disorder. Mind-body practices, whether active like Qigong or sedentary like mindfulness, produce opposite effects in practitioners. Key factors ramping up or suppressing the immune system are tempered. Balance is restored. Some biology scientists conclude new approaches are needed to study how genes are regulated by elements associated with human uniqueness, such as consciousness, cognition, and spirituality. They resonate with the lessons many physicists have drawn from their discoveries where the associations between modern physics and Eastern thought are now commonplace. “Millions of people around the world already enjoy the health benefits of mind-body interventions like yoga or meditation, but what they perhaps don’t realize is that these benefits begin at a molecular level and can change the way our genetic code goes about its business,” said Ivana Buric, Coventry University, London, who led a team of investigators from five research centers in three countries. Trillions of cells in the human body provide its structure, take in nutrients, convert nutrients to energy, and have specialized functions. Cells contain all the hereditary information necessary for regulating functions and transmitting information to the next generation of cells. Mind–body practices help us connect to and talk with our cells through inborn, invisible cooperative pathways. The benefits to our well-being are clearly seen. How remains a mystery. Does spirit play a part? Oneness? Part 2 explores body–mind–spirit connections through Qigong to maintain and harmonize pathways for healing. Source: Buric, I., M. Farias, J. Jong, C. Mee, and I. A. Brazil. 2017. “What Is the Molecular Signature of Mind–Body Interventions? A Systematic Review of Gene Expression Changes Induced by Meditation and Related Practices.” Frontiers in Immunology 8(670): 1–17. http://journal.frontiersin.org/article/10.3389/fimmu.2017.00670.